Just 2 mintes walk from metro station, well-developed infrastructure: shops, supermarkets, vegetable market: ideal for buying provisions for breakfast, lunch or supper, also pizzeria, cafes and trade center. 15 minutes by metro to Tverskaya station. 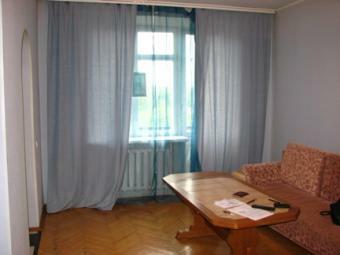 Kitchen 7 sq.m., room 15 sq.m pletely furnished and equipped apartment with two sofas and balcony. TV, telephone, Internet access (UNLIMITED!). Voice Intercom. Very comfortable for 2 persons.